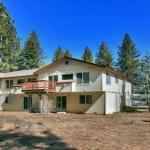 Sunny Townhouse Near Beaches is set in South Lake Tahoe and offers barbecue facilities and a garden. The South Tahoe Ice Arena is within 4 km of the apartment and free WiFi is provided. This 3-bedroom apartment comes with a kitchen a seating area and a cable flat-screen TV. Washoe Meadows State Park is 5 km from the apartment while Tahoe Queen is 6 km from the property. The nearest airport is Reno-Tahoe International Airport 68 km from Sunny Townhouse Near Beaches.